Using pagan fiction produced in Greek and Latin during the early Christian era, G. W. Bowersock investigates the complex relationship between "historical" and "fictional" truths. This relationship preoccupied writers of the second century, a time when apparent fictions about both past and present were proliferating at an astonishing rate and history was being invented all over again. 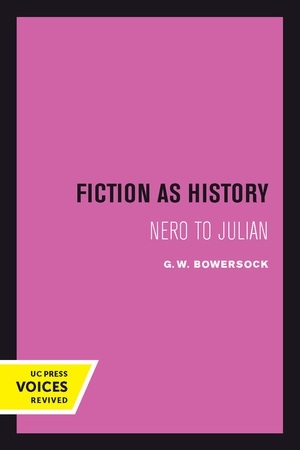 With force and eloquence, Bowersock illuminates social attitudes of this period and persuasively argues that its fiction was influenced by the emerging Christian Gospel narratives. Enthralling in its breadth and enhanced by two erudite appendices, this is a book that will be warmly welcomed by historians and interpreters of literature. This title is part of UC Press's Voices Revived program, which commemorates University of California Press’s mission to seek out and cultivate the brightest minds and give them voice, reach, and impact. Drawing on a backlist dating to 1893, Voices Revived makes high-quality, peer-reviewed scholarship accessible once again using print-on-demand technology. This title was originally published in 1994. G.W. Bowersock is Professor Emeritus of Ancient History at the Institute for Advanced Study in Princeton. Among his many books are Roman Arabia and Hellenism in Late Antiquity. He is coeditor of A. D. Momigliano: Studies on Modern Scholarship. His most recent book is The Crucible of Islam.